Trends come and go, but classic design never goes out of style, and it’s with this thought that you should always start to design your kitchen. 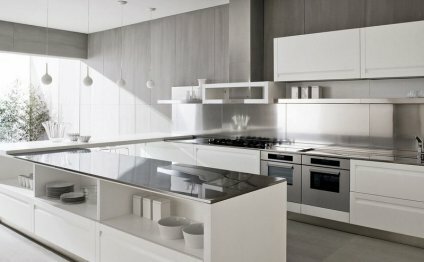 When it comes to kitchen design, it’s simply hard to beat a white kitchen! Can a kitchen get more classic than a white kitchen? White kitchens have been designed for so long and even though new ideas are often incorporated, if well-designed, a white kitchen will look current for decades. All you need to do is to choose timeless materials and a classic design. Take for example this inspiring white kitchen designed by Conceptual Kitchens and Millwork. This kitchen has not only beautiful white cabinets, but also includes elements that hardly ever will look outdated, such as white marble, hardwood flooring and extensive use of millwork. As we all know, designing a kitchen never comes cheap and it’s for this reason that I strongly feel that you should give extra attention when designing yours. Get to know how to maintain your countertops (if they require extra care) and also make sure to choose durable materials. That decision will pay you back down the road. Lastly, always remember to add you own personality to your white kitchen. You want it to feel welcoming and warm. This is probably a room that you will spend many hours of your day in so make it be your heaven at home! This white kitchen is perfect in every detail! The classic white cabinets beautifully incorporates the two-and-a-half-inch-thick marble countertops and the marble slab backsplash. Faucet is by Rohl and sink is by Waterworks. A kitchen can’t only be beautiful, it also should be practical. The cabinets in this kitchen was smartly designed by Wm Ohs. Notice the spice pantry on each side of the range. The range is by Viking. Flooring is dark-stained, hand-scraped walnut floors. A must have in my dream kitchen? Beadboad ceilings and walls! It adds texture and so much charm to any kitchen. This is a great butler’s pantry: simple but completely practical. Ceiling Paint Color: “Cowgirl Blue #VM137 by Ralph Lauren Paint” (Reduced by 50%). The chairs are the “Colefax chair by Hickory Chair” and fabric is “Sohil Crewel” – Indigo – #2007117-15 by Lee Jofa. Now, it’s your turn to share your thoughts here… Share about how you feel about your own kitchen. Are you happy with it? If you could change anything, what would that be? Oh, another week that’s going by fast! I will be busy all day today with the kids and I am getting some work done around my house, which means, I have to select some decorative pieces, wall color and some furnishings. I want my house feeling very special when Christmas arrive! Wishing you all a safe and happy day!